Asbestos Safety and Eradication Agency CEO Peter Tighe says he knows of 64 sites that have used asbestos-tainted concrete fibre sheeting, but that is just the “tip of the iceberg”. Importing asbestos into Australia has been illegal for several years, but as the local manufacture of building products declines, the substance has been slipping into the country illegally. The experts say it primarily comes from China in products seemingly certified “asbestos free”. “It's an emerging problem and it seems to be growing exponentially, as more and more products are brought into Australia, because of the wind-down of manufacturing in this country,” Mr Tighe said. “What we've really got now is really an indication which could be the tip of the iceberg. “Our young tradespeople haven't been trained to deal with these products. They think they're asbestos free. “It's really a risk to these individuals, to their clients and to members of the public who might be in the vicinity when there's cutting, drilling or manipulation of asbestos cement products,” he said. Safety authorities says there are 64 building sites of concern nationwide, including 17 in New South Wales, 13 in Queensland and 11 in South Australia and eight in Victoria. 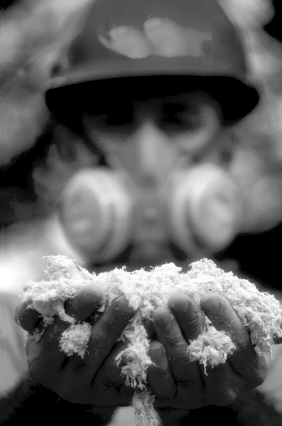 Unions and victims of workplace asbestos exposure (which causes deadly conditions including mesothelioma) says that the problem is linked to the decline in local building product manufacture. They argue this will only worsen under the China-Australia Free Trade Agreement (ChAFTA). But the Australian Border Force (ABF) says it has a handle on the situation. The ABF says anything coming into the country deemed “high risk” is physically examined, and that it has a watch-list of more than 40 products, importers and manufacturers. The issue was discussed during a trip to China last year, the officials say. “The Commissioner met with a number of senior Chinese customs officials and discussed a number of border control and trade issues of mutual interest and concern,” a spokesperson told reporters. The agency will not confirm which companies are under investigation for importation of asbestos building products.